Hey everyone Shanna here to share a little magic and love I have for making tags! Okay my first tag turned out amazing and I love love love it. 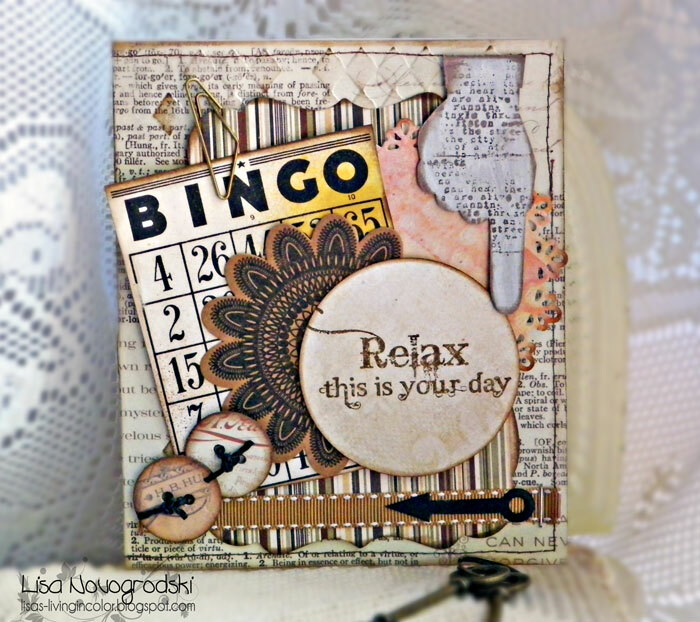 I used lots of layering on this tag. So I gave it a quick dry brush of gesso and SHA BAM BAMM!!!!! I said well it still needs a splash of color so I tried out my new Heidi Swapp spray I picked up from an awesome sale Susana was having and threw the sentiment on it and MAGIC!! You can still see color poking through but muted a bit. That doily looks awesome right!!! I painted the chipboard with something and I don't quite remember most likely a Tattered Angels Glaze and gave it a body with pearls and antennas were made with string beads. I love the look on how this turned out! So grab your chippies and come play! Hey all! Monica here with a tag of my own to share! Gina has doiles that come in 2 sets - 8 inch and a variety size set. She has intricate cut pieces too. Now enough of how fabulous these doilies are and a little about my piece. Oh almost forgot I used "Hope" from here Words & Phrases sets. I inked a prima flower to match the paper which actually is the packaging from something I bought lol. Stamped a hot air balloon and used some wallpaper tape. Just right click on the image to save it to your computer!! 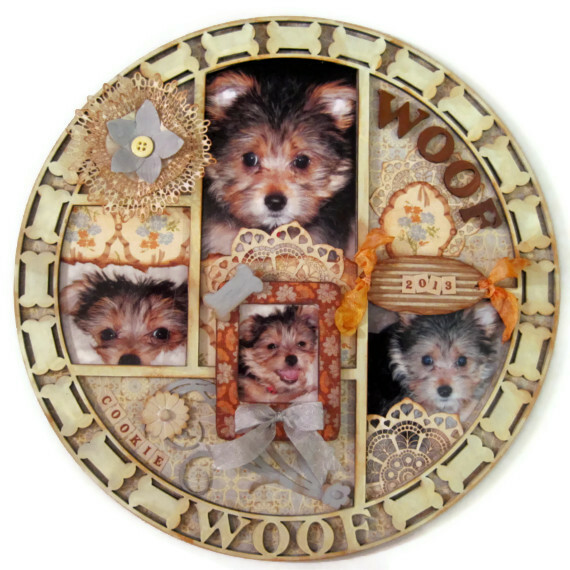 Last week you saw the cat version and this week Dawn Rene is here to share the dog version of Gina's Designs photo tray. They have other trays too - cats, gears, trains and more! I love decorating trays and shadow boxes. We recently added a new member to our family, Cookie. She is a teacup Morkie. But the highlight of the tray are the beautiful doilies. They are cardstock which I painted with Tim Holtz distressed paints. The doilies are so intricate - they are beautiful. 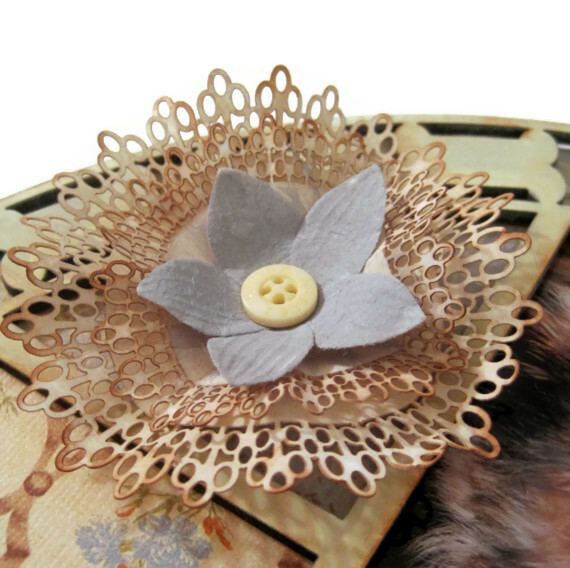 I took two doilies and crinkled them to make my version of a flower to add some dimension. Summer has definitely hit the Sunshine State and man is it hot, but perfect for flowers to bloom. 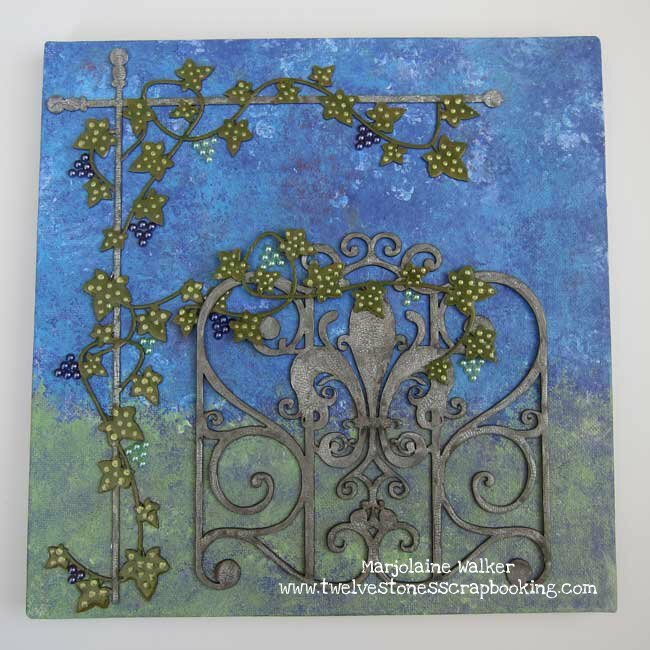 I found this wine canister and decided it would be perfect for altering and used more of Gina's Doily Intricate cuts. I was serious when I said I used them on literally everything. 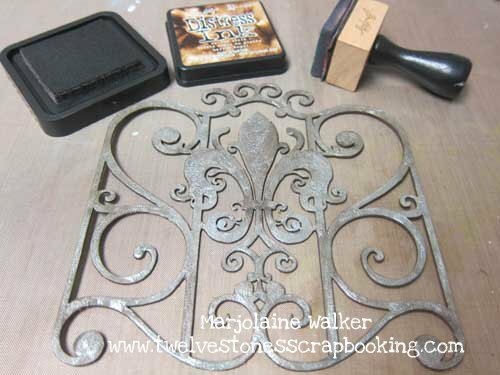 These make the best stamping backgrounds for all your projects. Hello Everyone! Rashida here with you today! 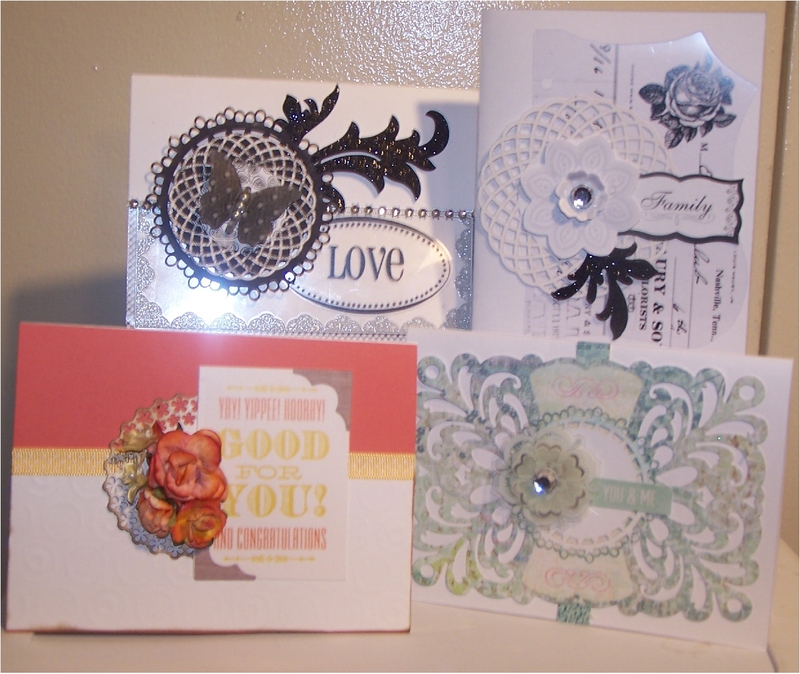 This week I played with Gina's doilies and created four cards. Here is what I came up with. Happy Monday everyone!! Simply Monica here to share a shaped mini album I made using my cricut to cut the different shapes of the pages. I added some Gina's Designs doilies and other miscellaneous chippies from Gina's Designs collections. This cover page you slide your photo under the Cottage Window frame and they come in 3 different sizes as well as the larger frame. 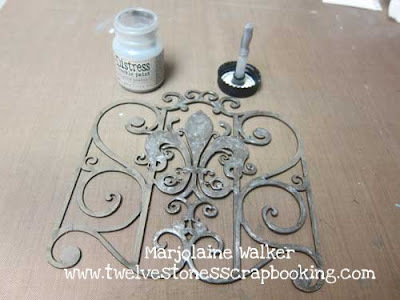 Here I added the Filigree Frames. I hope everyone enjoyed my post for today and be sure to stop by and check out all the new things Gina has been hard at work on! Thanks for stopping by. 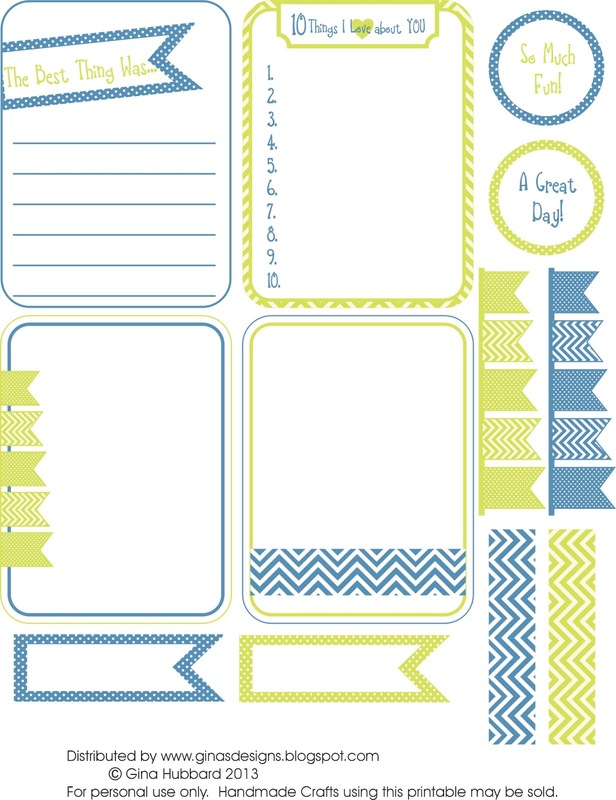 Here's a printable perfect for vintage projects. Please stop and visit the store for great chipboard and storage pieces! Hi everyone, it's Nancy here today with one of the Gina's Design's Photo Display Trays which currently are available in six styles. This one is called the "Cat's Meow". 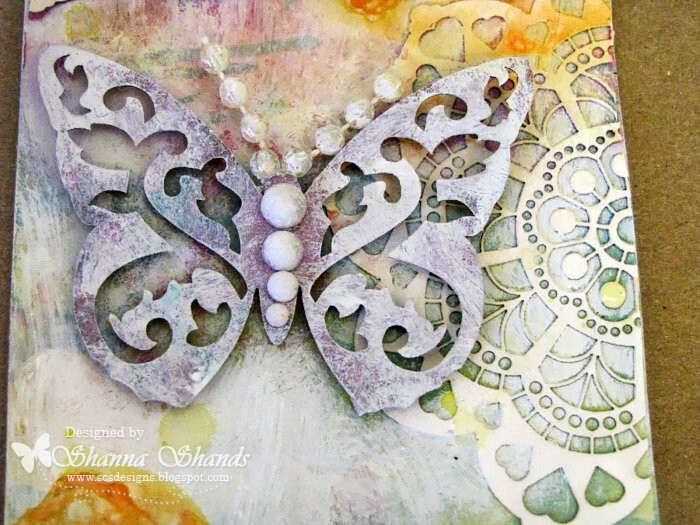 This was so much fun to create using one of my kitties "Timothy" as my inspiration along with shapes from our Nancy's Garden collection, and other favorite pieces from Gina's Designs. These Photo Display Trays are made of sturdy wood, and are so versatile and easy to work with. 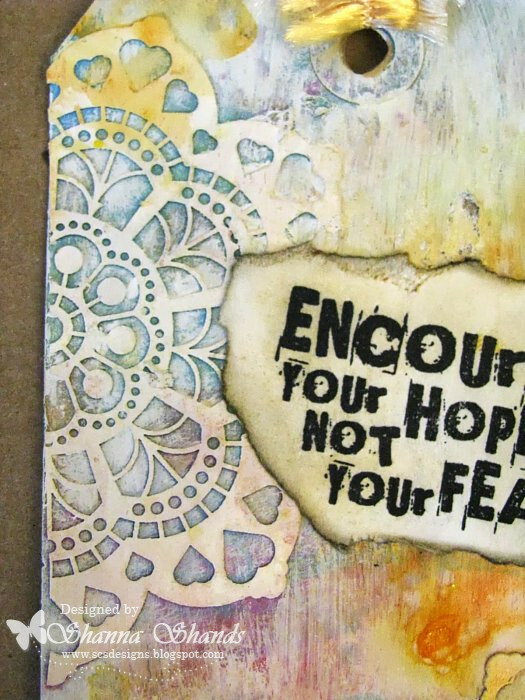 In this project my pieces were mostly colored with Prima Chalk Inks. 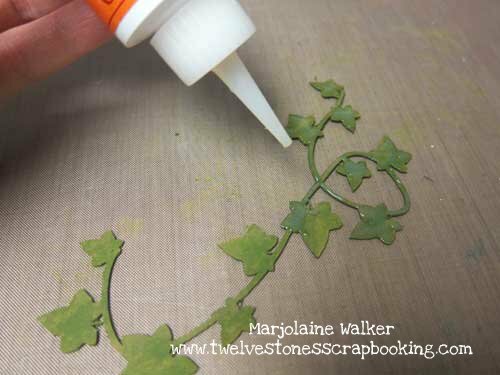 In some cases I've embossed with either clear UTEE, or Stampendous crystal embossing powder. 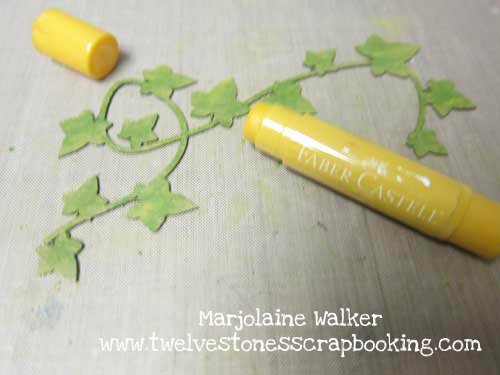 Here I used one of our Intricate Border Sticks, an Ornamental Birdcages Shape Set, and the Small Leafy Tree which I cut up into pieces. The word "love" is also from Gina's Designs, from the 10 word package. 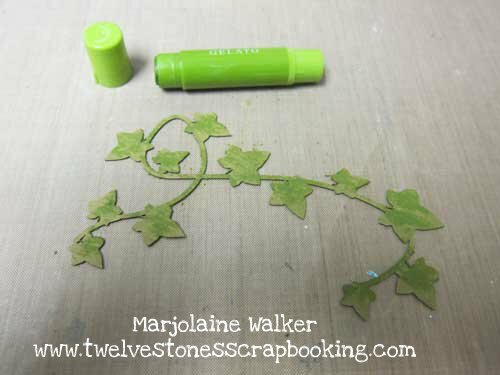 You can also see another view of the lace border stick and pieces from the leafy tree. Some of the grids come with overlay pieces. Here the word "meow", and two of the skeleton fish are overlays. I've framed this section with the smallest sized palm tree. Hi Gina's Designs fans! Rashida up with you today to share my layout using the Lamppost Set #2! I wanted to keep the colors soft, so I used white acrylic paint on the lamppost and lined the pole and the tops with pink pearls. Next I layered up the space behind the lamppost using handmade roses, white pearls and other items from my stash. The glassine bag tag holder was made from a previous Gina’s Designs Project. I made the tag inside the holder from my sticker stash. It reads : May your lives be filled with love and laughter. You can enjoy viewing more photo’s of this project on my blog. 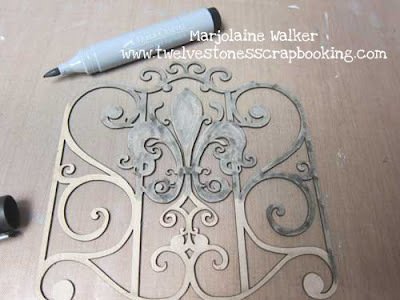 Marjolaine here today with a tutorial on how to dress up your chipboard. Follow along to create unique chipboard pieces for your layouts or artwork. 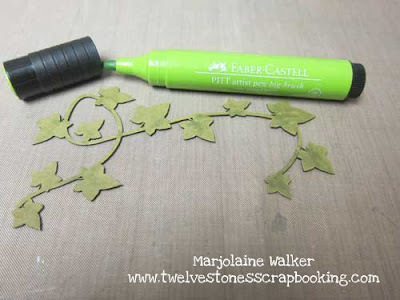 Color your chipboard with a permanent marker and allow it to dry. You might me tempted to skip this step since you'll be covering it up but it's really important to give your piece good coverage. Cover your chipboard with a layer of crackle paint of the same color making it thicker in some areas. Allow it to dry. Apply some distress ink with a blending tool getting the ink in all the cracks. It helps if your ink is a different color than your paint. 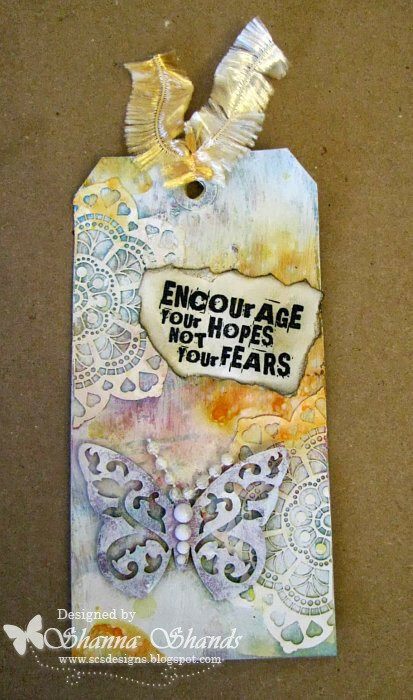 Color a different piece of chipboard with a permanent marker and allow it to dry. Paint the chipboard with a stick of Gelato from the same color family and use your finger to rub the color in. Add another color of Gelato in random places to add highlights. Cover your chipboard piece with 3D Crystal Lacquer or Glossy Accents and allow it to dry completely. 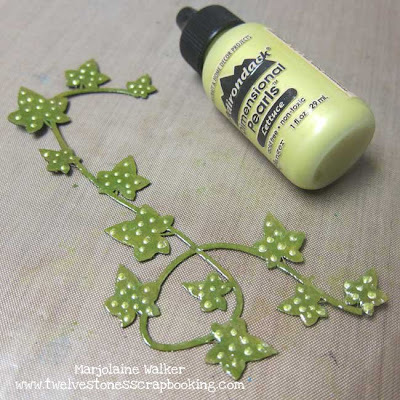 Make a dot pattern on your chipboard with the dimensional paint and allow it to dry. 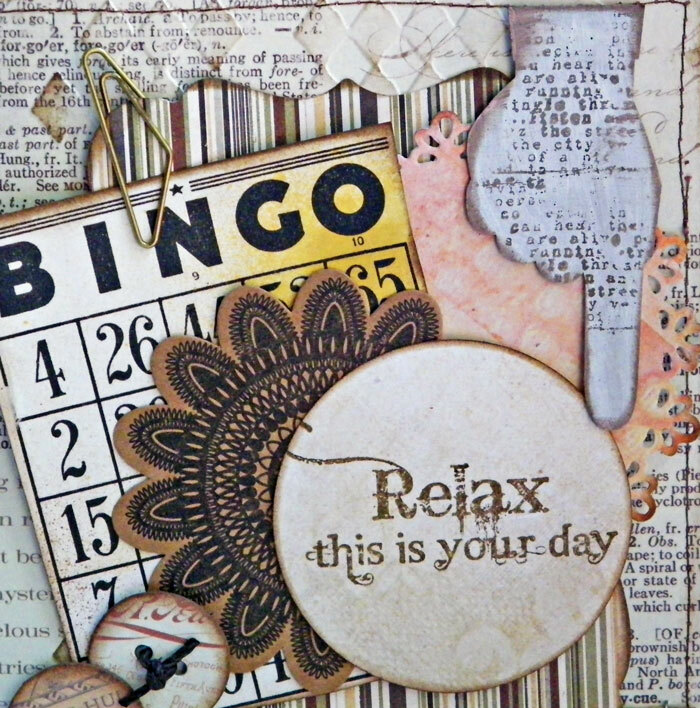 Your chipboard pieces are now finished and will make lovely accents or embellishments for any scrapbook page or mixed media project. Why not try different combinations of mediums, the results might surprise you! Hi Everyone! It's Lisa here sharing some cards with you today. In honor of Fathers Day I have created two cards with a masculine feel. 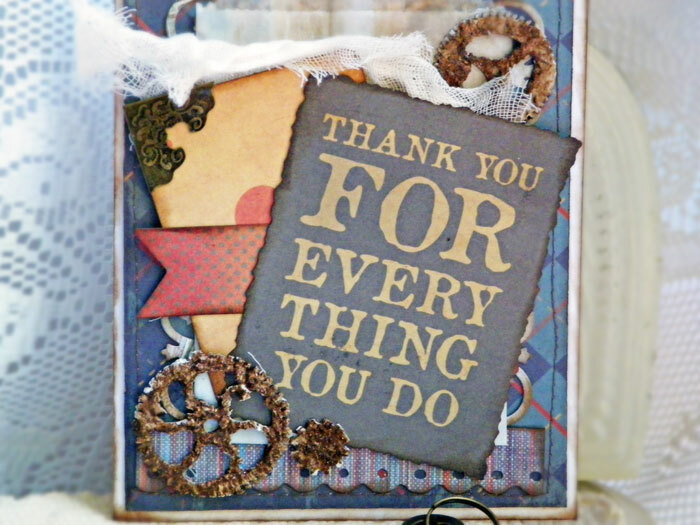 I've used the Gears Shape Set and Glassine Bags on this card. I love the glassine bags. I have been using them a lot lately and love how great they work with a card. You can slip a gift card in there! I inked up my glassine bag with Walnut Distress Ink for a vintage grungy look. The gears were covered in modeling paste then covered in Art Anthology for color and shimmer. I tucked some cheesecloth in there for a little softness and texture. My next card has another masculine theme. I used the hand in the Steampunk 2 Shape Set. I love how pieces of the steampunk set work with this style card. The chipboard had was painted with gesso then stamped and the edges were inked. 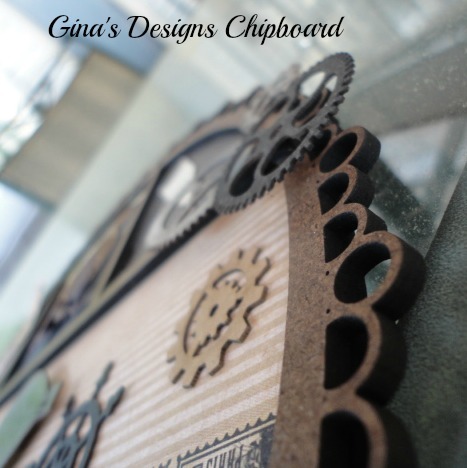 Gina has great chipboard shapes to enhance your cards and these are just perfect if you are thinking of making some masculine themed cards. Kathi here today to share my "manly" project with you. This is a wall decor. It was created using a vinyl saying, “The Man who says “It can’t be done” Should not interrupt the Woman Doing it” and was placed on a chalkboard painted board. I covered the edge of the frame with DCWV paper Tattered Time. Chipboard shapes added to the frame. 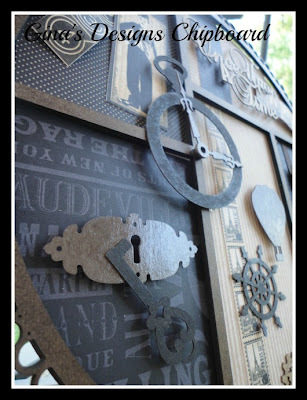 On the lower left used a pocket watch die to create a flying pocket watch by Tim Holtz. 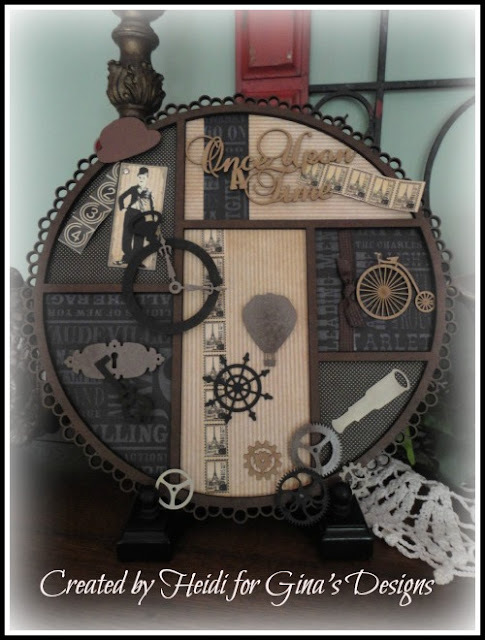 Sprocket gears from Spellbinders and a propeller from Gina’s Designs attach to a large gear from Gina’s with a new ringed brad by Tim Holtz. Numbers by Sizzix was added to the pocket watch. Large wings from the steampunk collection was pained (using distress paint by Tim Holtz) then added to the back of the pocket watch. A gear train beneath the pocket watch which was done in copper, silver, gold, weathered wood & shabby shutters. 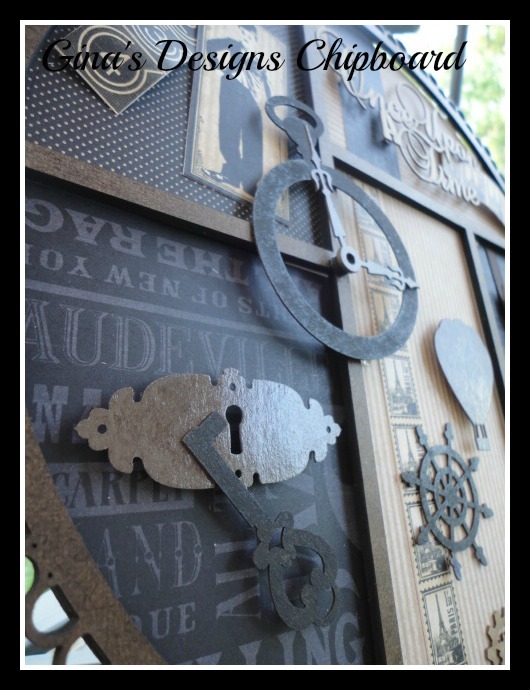 Moving across to the lower right, an Antique bike was placed over a weathered clock by Tim Holtz, along with a top hat and a hour glass. To match the project the top hat was covered with the paper that matched the edge of the frame. Here's a printable that is great for project life style books, smash books, or cards. Themed up for summer fun, this printable features bikes and scooters in blues and browns. 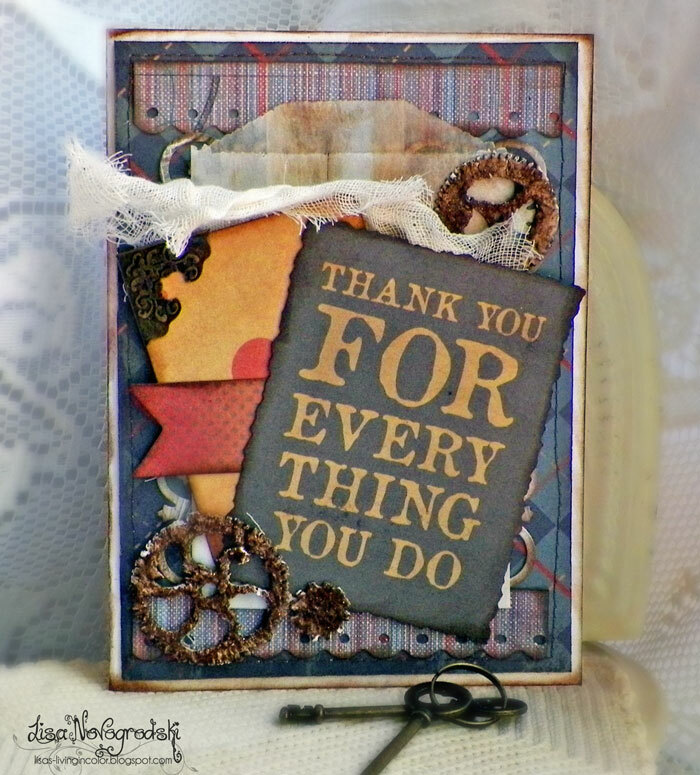 Here is a card by Kathi using today's freebie. 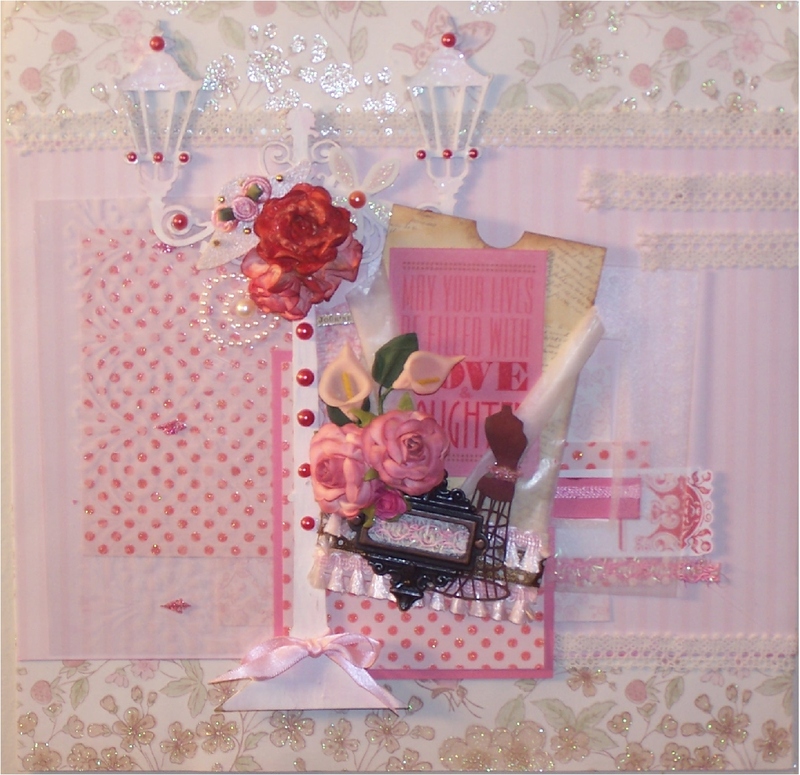 Hello, Heidi here again with some inspiration using Gina's Designs products. This is a frame and I chose to use it to make wall art but it would also be fabulous to put some photos in! Look at all those wonderful chipboard pieces too! I just needed to show you this photo, as you can see that most of the chipboard pieces I have painted. The watch is black but I did a very dry spray so it would look distressed/worn. then the key hole has a shiny sheen on it but the key does not (it is also worn). I wanted this piece to have some depth and texture and so I put some layers on it and you can see that here with the gears.